My sister came up with this creation. It’s simple and a little healthy. She didn’t have a name for it, but I like to call it mozzarella tomato pops. 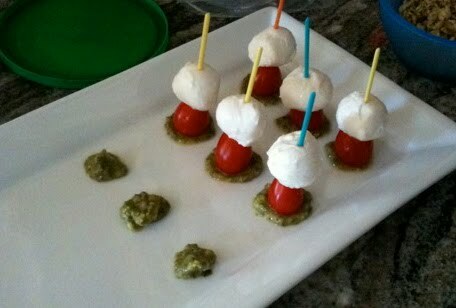 She put a dollop of pesto on the plate, then skewered a cherry tomato and piece of mozzarella on a toothpick. Personally, I think the cheese should be next to the pesto, but my sister thought the pops would roll away, so she cut off the bottom of the cherry tomato to get it to sit still on the dish. It looks cool, is easy to make (for those of us who are without major culinary skills) and is pretty tasty.